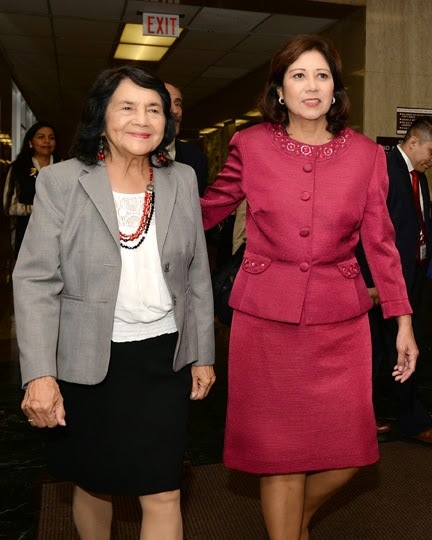 LA County Supervisor Hilda Solís at her swearing-in with political mentor Dolores Huerta. On a warm sunlit January morning this year, beloved East Side advocate for homeless youth and human rights activist Father Richard Estrada waited patiently to be recognized with an official edict issued by the LA County Board of Supervisors. He wasn’t the only one. Also waiting in the wings with supporters and well-wishers was widely heralded labor leader Maria Elena Durazo, a legendary advocate for the working class who, until recently, headed up the Los Angeles County Federation of Labor, an umbrella entity representing 600,000 workers, making her one of the most powerful union representatives in the nation. Both Estrada and Durazo were at the downtown Kenneth Hahn Hall of Administration to accept recognition from the County Board of Supervisors at the behest of newly installed Supervisor for the 1st District, Hilda Lucia Solís. Sworn in at the beginning of last December, Solís had run virtually unopposed for the seat being vacated by long-time Supervisor Gloria Molina. The 1st District includes Boyle Heights, East LA and a large swath of what we refer to as the Greater East Side. The soft-spoken San Gabriel Valley native had not long before received a formal endorsement from Molina at an LAC+USC Medical Center press conference in which both expressed their concern for the physical and mental health of the county’s less privileged and uninsured as well as the countless women and children who are usually the first to fall prey to the health issues stemming from poverty and violence. The child of a Mexican immigrant father and a Nicaraguan mother, her story parallels that of many raised by immigrant parents during the last half century in Southern California, parents who believed that honest, hard work and a belief in the tried-and-true political system were enough to earn them a place at the table and chance to pursue the elusive American dream. After a childhood in La Puente, where she became the first in her family to attend college, she became politically active on campus at Cal Poly Pomona, eventually earning a degree in Political Science. Her parents met, so the story goes, in a citizenship class during the early 1950s. Her father, Raul Solís, had been a labor activist in Mexico and organized for the Teamsters at a battery plant after his arrival in the U.S. Her mother, she notes, went to work in a Mattel Toys assembly plant after her children were all of school age. Her mother, she says, was also a vocal advocate for just working conditions and a fervent union member. Her parents settled in La Puente in the late ’50s, says Solís. “It was a family friendly neighborhood… very [ethnically] mixed. My mother had this tradition of baking and cooking in our house and inviting all of our friends from the neighborhood over,” Solís recalls. Her mother, named Juana and now 88, she says, was the reason she got to know so many other working-class families in her community. In high school, she was fortunate to encounter a guidance counselor named Robert Sánchez, who was convinced she had what it took to pursue post-secondary education. “He said, ‘You should really think about going to college.’ He was half Mexicano and half Irish,” Solís recalls. With grants and financial aid as well as support from the Educational Opportunity Program, or EOP, and a series of part-time jobs, she finished with a degree in poli-sci. “I was very involved in the Mexican American Students Association. As a student, I was very active. I wanted to contribute, to learn,” Solís says. “I really liked government.” After finishing up at Cal Poly, she earned a Master’s in Public Affairs at USC. Her interest in public service and her desire to effect change at the government level led her to Washington D.C., where she served as editor-in-chief from 1980 to 1981 for a newsletter produced by the White House Office of Hispanic Affairs under the Carter administration during an internship undertaken as part of her master’s program. Invited to stay on after Reagan was elected, she briefly became an analyst in the Civil Rights Division of the Office of Management and Budget, but left soon thereafter because she missed home and vehemently disagreed with Reagan’s policies. Returning to LA County in 1982, she took on a role, according to an early article in the Los Angeles Times, as Director of the California Student Opportunity and Access Program to help students from low-income backgrounds gain access to university level education. Encouraged to run for the Board of Trustees of Rio Hondo College in 1985, she was elected handily and served there until 1989, she says. Solís was the first Hispanic woman ever elected to the California State Senate and the first woman to represent the San Gabriel Valley. She was also the youngest senator at the time. The rest is recent history, and it goes without saying. She was reelected in 1998 with 74% of the vote, running on her record of consistent progressive positions in support of labor, immigrant rights, health care, victims of domestic violence and protecting the environment. “I was there for six years,” Solís explains. In 2000, after serving the maximum number of terms a State Senator is allowed, Solís challenged a conservative incumbent for his seat in Congress. She was, by this point, a nationally prominent political figure who had never shied away from challenging the close-knit boys’ clubs rampant in the halls of government, often authoring legislation that was usually described by her moneyed detractors as anti-business and anti-California. When Governor Pete Wilson vetoed a minimum wage increase, she spent, according to Wikipedia, $50,000 of her own campaign money to create a state ballot initiative behind the wage increase that was ultimately successful in overturning the Governor’s opposition. In the race for U.S. Congress she bested Matthew “Marty” Martinez in a Democratic primary by a 69% to 31% margin. After serving valiantly in Congress for almost a decade, where she continued to vote her conscience and remained true to the positions she had delineated clearly during a lifetime of political service. When her term—Obama’s first term—ended, Solís was ready to head home. The San Gabriel Valley beckoned, and she felt she’d accomplished much of what she’s set out to do on a national platform. To many, it was natural that she would seek a slot on the Board of Supervisors, since it was the most obvious place for her to build upon a long-standing track record for agency on behalf of those who would otherwise not have intelligent and compassionate and sincere representation. She learned this early on, she confesses, “from Dolores Huerta.” Now a close friend, Huerta and her commitment to social justice, remain imprinted in her memory and are essential elements in her will to create a better world by working to empower a fair and just cadre of public servants who can follow in her footsteps, just as she has done, she confesses, in seeking to emulate the selflessness of leaders like Huerta and Chavez.